In their first inter-continental sports competition of the 21st century, the Indian sportsmen and women have done the country proud with an unbelievable haul of medals — 32 gold, 21 silver and 19 bronze — in the just concluded XVIICommonwealth Games at Manchester. Their third place has been the highest ever occupied by them in 44 years in the Games. Mohammad Ilyas Babar was not the conventional sort of athletics coach Indians were familiar with. He was different, both in his coaching methods, and in his sartorial habits. Many mistook the kurta-pyjama clad, white-cap wearing Babar, for an illiterate, rustic "Mullah", the sort of person one encounters in the lanes and bylanes of the walled city. The announcement about the revival of the All-India Council of Sports is generally being viewed as a political move. Any another explanation will only be a subterfuge. It is very difficult to understand the grave diggers job that has been done at a time when there is a full fledged Sports Ministry headed by a full time minister. On a beautiful Royal Springs gold course (Srinagar) and amidst serene and captivating surroundings, Digvijay Singh raised his game to dizzy heights on the final day to bag the coveted title and a sizable purse. In the previous edition at Kuala Lumpur (Malaysia), India had taken the seventh spot with seven gold, 10 silver and eight bronze medals. Doping may have left a bitter taste in the mouth in the end but one must get to the root cause this malaise afflicting international sports. Interestingly, if one looks back at India’s performance in these Games since 1958, the average carry home tally has been between 10 and 25. In 1958, India ended with two gold and a silver of which a gold (Hav Lila Ram, the legendary wrestler) and a silver ( L.K. Pandey) came from wrestling alone. The second gold was won by Flying Sikh Milkha Singh in athletics. The rich haul at Manchester apart, the gold medal winning performance by any Indian track and field star is yet to be repeated even after 44 years. In track and field India’s women athletes broke the ice with their first ever silver and bronze medals in field events. Neelam Jaswant Singh (discus throw) and Anju Bobby George (long jump) have entered the record books with their medal winning performances. Shooting: 10m air rifle — pairs (M) 1184 (CR) 10m air rifle — pairs (W) 795 (CR), 10m air rifle — singles (M) Bindra Abhinav 590 (CR), 10m air rifle — singles (W) Bhagwat Anjali 102.8 (CR), Bhagwat Anjali 398 (CR) 25m centre fire pistol — singles (M) Rana Jaspal 583 (CR) 50m rifle 3 positions — singles (M) Singh Charan 97.5 (CR) 50m rifle 3 positions — singles (W) Bhagwat Anjali 100.0 (CR) Bhagwat Anjali 578 (CR). Weightlifting: up to 48 kg (W) Nameirakpam Kunjarani Devi 167.5 (CR) up to 53kg (W) Chanu Sanamacha 182.5 (CR) up to 63kg (W) Kumari Pratima 205.0 (CR) up to 75 kg (W) Pujari Shailaja 222.5 (CR). In fact if members of Indian diaspora in England walk with their heads held high, it is because of tremendous success of the sporting contingents from their motherland in the past few weeks. First, it was Saurav Ganguly and his men who notched up a sensational victory over England in the triangular one-day series. Disappointment at the failure of their men’s hockey team from qualifying for the Commonwealth Games notwithstanding, the die-hard Indian-British had a lot to cheer about over the scintillating performance by Indian shooters, weightlifters, wrestlers, boxers, women hockey players, judokas, paddlers and shuttlers and also track and field stars. *	Gold medal in women’s hockey. *	Bronze medal for Indian woman athlete in Commonwealth Games — Anju Bobby George — long jump. *	Silver medal for any Indian woman athlete in Commonwealth Games — Neelam Jaswant Singh — discus throw. * Gold medal for Mohammed Ali Qamar in light flyweight (boxing). The cynosure of all eyes were our shooters, weightlifters, wrestlers and boxers besides the women’s hockey team. Chandigarh’s own Abhinav Bindra, the most talented shooter after Jaspal Rana lived up to expectations and returned home with a couple of medals adding to his already bulging tally won in various international competitions. Both Jaspal Rana and Anjali Bhagwat were the undisputed star performers of the Games. They not only won four gold medals each, but also entered the record books by setting new marks in their respective events during the Games. Abhinav Bindra and Charan Singh, too, had set new Commonwealth Games records. In weightlifting, all the four main women lifters — Kunjarani Devi, Sanamacha Chanu, Pratima Kumari and Shailaja Pujari — not only made a clean sweep of gold medals in their respective events but also set new Commonwealth Games records. Hockey continues to be the game with which every Indian continues to be sentimentally attached. In the pool matches when India drew with hosts England, there was a disappointment everywhere as the chances of our team making it to the knockout stage were reduced considerably. The girls, however, turned the tide and beat South Africa with a golden goal to make it to semi-finals where they overpowered their pool conquerors New Zealand to set a title clash with England. It was again a golden goal, "disputed" by England but upheld by the technical committee of the International Hockey Federation, that gave Indian girls their first major hockey gold in any FIH tournament after the 1982 New Delhi Asian Games. Equally impressive performance came from wrestlers as Ramesh Kumar, Krishan Kumar and Palwinder Singh Cheema won gold medals in their respective weight categories. For Krishan Kumar, it was all the more creditable as he carried on with a severe knee injury to fight off stiff competition from his Canadian opponent in the second half of the final bout. Anuj Kumar, Shokinder Tomar got silver medals while Anil Kumar Mann got a bronze in wrestling. In boxing, Mohammed Ali Qamar’s gold was a path-breaking performance. In fact, gold was also expected from Som Bahadur Pun but he lost to his rival from Pakistan in the final while Jitender Kumar ended with a bronze. Aparna Popat’s bronze in women singles was heart warming after P. Gopi Chand lost in the quarter-finals of men’s singles in badminton. Badminton is one sport where India can improve and do better. In table tennis, there was some disappointment after Raman Subramanian and Chetan Baboor, the top seeds, lost in semi-finals of men’s doubles in table tennis. Chetan had some consolation by winning a bronze in men’s singles also. 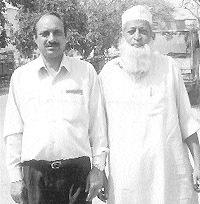 Ilyas Babar with his most famous pupil, Sriram Singh, photographed by P.K. Mahanand during the Veterans Athletic Meet in Delhi two years ago. This was the last snap shot of Babar, taken with Sriram Singh, before he shifted to Hyderabad. But Babar was no rustic "Mullah". He was an educated, qualified coach, whose obsession with athletics was legendary. But only those who knew Babar closely knew Babar the man. He was a simple man, and led a spartan life. Simple living and high thinking was his motto. He practised what he preached, in letter and spirit. But his coaching techniques and tactics were world class. No wonder, Babar was known as a coach with "Midas’ touch", though he died a broken-hearted man when the people and institutions he trusted and believed in, betrayed him, in the evening of his career. When Ilyas Babar breathed his last in Hyderabad last week, he was a ripe 76 years old. He had always kept himself fit, like a fiddle, as they say, and his unexpected demise came as a shock. Had the people in authority shown a little more compassion and consideration towards this venerable coach, Babar would have perhaps lived a few more years to realise his dream of producing an Olympic champion. It was ironic that Babar died at the Nizam Institute in Hyderabad, in his home state of Andhra Pradesh, though throughout his career, Andhra Pradesh had given him the cold shoulder. But during the last days of his life, when Babar battled with stomach ulcer, the Andhra Pradesh officials went out of their way to help him. But the help was too little, too late, as it were. Not many people knew that Ilyas Babar was a B.Com from the Osmania University in Hyderabad. He was also one among the first batch of coaches to pass out of the National Institute of Sports, Patiala, in 1961. Babar started his sports career as a 110 metres hurdles State champion in Andhra Pradesh. He was State champion for a decade, and signed off his athletics career with the state meet in 1958. But the late Ghous Mohammad Khan, the first Indian to reach the quarter-finals of the Wimbledon Tennis Championship, encouraged Babar to take up coaching in an honorary capacity at the Osmania University. And very soon, a reluctant Babar made his mark as a coach. He trained many talented athletes, one of whom was B V Satyanarayan, who represented India at the Rome and Tokyo Olympic Games. At the university level, Babar produced players of the calibre of Saroja Gopalan, Nausha Thanwala, Aziz and P K Mahanand, the last-named becoming a university and state champion in discus and shotput. Mahanand went on to become a national weightlifting champion as well, and a Wing Commander to boot, in the Indian Air Force. Though Babar was not very keen to pursue athletics coaching as a career, he ended up doing precisely that, starting with the National Defence Academy at Kharakvasla, where he coached officer-cadets. Many of his pupils rose to become Major-Generals, and one a Lt-General. They always treated Babar Sahib with love, affection and respect, despite their high-ranking. Later he took up an assignment at the Rajputana Centre at Farrukhabad, in 1960. There he trained athletes on sand, and produced Jagmal Singh, who represented India at the Rome Olympics, at the age of 40 years. But Babar cut his coaching spurs, so to say, at the Rajputana Rifles in Delhi, where he persuaded Sriram Singh to switch over to 400 metres and later to 800 metres, though his first major champion disciple was B.S. Barua of Assam, who won a gold medal in the 1966 Asian Games. Barua gave full credit to Babar for his success, and thus was born the legend of Ilyas Babar. Thereafter, it was a success story unmatched by any other coach in India. Babar produced five Arjuna awardees — B.S. Barua, Awtar Singh, Charles Borromeo, Sriram Singh and Geeta Zutshi. Among these athletes, Sriram Singh, Charles Borromeo and Geeta Zutshi also received the Padma Shree. Even ‘Flying Sikh’ Milkha Singh had the greatest regard for Babar Sahib. Sriram Singh attributed his success in athletics to "Babar Sahib’s focused attention, and scientific, yet rooted-to-the ground coaching methods". It was the searing pace set up by Sriram Singh, watched by Ilyas Babar, that motivated Cuban Alberto Juantorena to shatter the then existing Olympic and world records in the 800 finals at the Montreal Olympic Games in 1976. Babar was voted the Adidas Best Coach of Asia in 1978, and was presented a golden shoe. Later the Dronacharya Award was also bestowed on him, though it came at the fag end of his life, at the age of 73. Babar was honoured with the Dronacharya Award, the highest sporting honour a coach can aspire for in India, thanks to the initiative taken by the late Union Minister Madhavrao Scindia and then Sports Minister Mukul Wasnik. Babar produced an Asian champion — B.S. Barua — within three years of training him, and trained Sriram Singh closer to an Olympic medal, taking even less time. But sadly, Babar was never given his due. He was never selected as the national coach, and even the Rajputana Rifles shut the doors on him, when he sought a nominal raise in his retainership, after he won the Dronacharya Award. He went to Montreal to watch his pupil Sriram Singh run on his own, after selling his scooter and other house hold articles. He planned all the races of Sriram Singh though the official Indian coach was someone else. Sriram Singh went on to reach the finals of the 800 metres, setting an Asian Contintental record of 1m 45.77 secs, which remained an Asian record for 16 long years. Babar was greatly influenced by the teachings of German world record holder Dr Otto Peltzer, and the training methods of Percy Cerutti. After Sriram Singh caught world attention at Montreal, Babar was hailed as a "world class coach". But he never put down his coaching methods in a book form for others to emulate. He also died without realising his dream of producing an Olympic champion. Despite his high achievements, Babar was not given an Indian blazer. But he did not complain. He stoically took everything in his stride, even when lesser mortals slighted his high achievements, and Rajputana Rifles threw him out his quarters. He then shifted to Hyderabad, where he spent the rest of the life in virtual seclusion. But his legion of admirers and pupils will always remember Babar as a coach with a vision, who was ahead of his time in his teaching methods. And that itself is a great tribute to the man’s legendary qualities. The All-India Council of Sports cannot take over the functions of the Sports Ministry. It can only act in an advisory capacity. But then that job is already being done by the Sports Authority of India which replaced the NIS Patiala -LNCPE, Gwalior combine years ago. What job will the AICS do in the present context? Act as an adviser to the adviser? And what role then will be that of the Indian Olympic Association? The IOA is an affiliate of the International Olympic Committee and its job is to ensure that the federations in the country follow the rules and regulations in both word and spirit. If the whole idea , as has been propounded, was to place Mr Vijay Kumar Malhotra in the eerie as it were and to use his administrative skill in sports, other avenues could have been exploited. Perhaps it is not known that Mr Malhotra is a senior vice-president of the IOA and he is there because of the Archery Federation of which he is the president. Mr Malhotra’s contribution in the promotion of this particular discipline is praiseworthy and needs no elaboration. If it was a question of service to sport Mr Malhotra could have easily expanded his activities in the present role itself. Why then this largesse in the form of the chairmanship of the All-India Council of Sports’. The revival of the AICS is indeed baffling. Perhaps the government has excess money at its disposal and needs another outlet to spend. If the AICS has been revived to rejuvenate sports in the country at this juncture then perhaps someone will enlighten us as to the reasons why it was wound up years ago when Mr V.C. Shukla was the chairman. Before him there had been a series of distinguished personalities which included General Kumarmangalam and Field Marshal Maneckshaw. In fact it was during Kumaramangalam’s time that the country saw a revolt of the hockey players while at camp in Patiala prior to a major international. The AICS was buried for a reason and in its place came the Sports Authority of India. There is no reason why it should be brought back to life and play the same role as the Sports Authority of India that of an adviser. Why two such high profile units with the same job? If the government was unhappy with the Sports Authority of India, and also wanted to give Mr Malhotra an important job, it could have easily made him head of the SAI. It just does not make sense. The revival of the AICS is perhaps one way of the government telling the world that it is aware that something must be done to improve the standards. All that is very encouraging but it could have been done by streamlining the existing administrative units. "Diggie", to his friends and admirers, played with the spirit of devil-may-care attitude. This attitude paid him rich reward. "I am surprised and happy at my performance", said an elated Digvijay who seems to have learnt a lesson of golfing life that too much of worrying about swing, drives and putting is not conducive for performing well. One of the most relaxed and easy-going players on Indian circuit, Digvijay had a very bumpy ride during the last two seasons. He was in Srinagar after a long lay-off which seemed to have sharpened his mind and muscles. He came from behind to surprise his rivals. To win the title is one thing but to make up a five-stroke deficit on the final day showed how focused he was in the inaugural tournament of the season of the Hero Honda Indian Tour. Coming from an obscure city of Meerut, Digvijay Singh earned Rs 2.43 lakh, while Harmeet Kahlon and Feroz Ali got Rs 1,31,250 each. Chandigarh’s Ranjit Singh was fourth. The competition, which has impressed all Indian pros, saw Jyoti Randhawa, brother-in-law of Digvijay Singh, play well within himself after staying away from competitive golf because of motor-cycle accident. If more is expected to be heard and seen of Digvijay Singh in the season, Randhawa’s game showed that he had fully recovered from his injury. Those, who have been monitoring Jyoti’s golfing career, feel he is too good a golfer to be indulging in two-wheeler extravaganza on Delhi roads. Since Kahlon’s superb win at the DLF course is a major tournament in the last season, he has not raised his game to the level he should have. He is a player who has essentially a very sound technique. He should take a leaf out of Digvijay Singh’s book that needless worry about swing and coaching is counter productive. There are some golfing pundits who are of the view that the Indian Open should be staged in the valley, so beautiful is this course. God willing, the conditions in Srinagar will be further normalised soon and it will be the day to watch leading golfers of Asia and other parts playing at the valley, which continues to be as magnificent as the course is impressive. It is said that there are only two things that are done with head down. They are playing golf and praying. Maybe, golf and prayers will help more peace descend in the valley in the years to come. Olympian and Asian Games gold medallist, Captain Mohinder Singh, died at his native Khan Khan village in Nawanshahr district recently but neither the Union Sports Minister nor the Punjab Sports Minister, Chief Minister or Governor mourned his death. The late Captain Mohinder Singh won the gold in triple jump in the third Asian Games at Tokyo in 1958. He should be given the Arjuna Award for lifetime contribution. Last time the Arjuna Award for lifetime contribution was given to Lalit Bhanot, whose contribution in the field of athletics was only up to the national level. The Arjuna Award has also been given to quarter-miler Paramjit Singh, who only won a bronze in athletics in the Bangkok Asian Games in 1998. Kapil Dev’s selection for the prestigious Wisden Indian Cricketer of the Century award is a tribute to this great allrounder. It is also a matter of pride for millions of his fans and admirers. Without doubt, he was one of the great allrounders that India has ever produced. His record in both forms of cricket speaks volumes of his talent. His deadly outswings and batting ability made him look different from the others. His fitness and injury-free career made him stand out from the rest. Really, this ‘Haryana Hurricane’ deserves this award. Nasser Hussain, captain of England cricket team, deserves heartiest congratulations for cracking the 11th century (155) in the Test match. He came at the crease when the score was zero and one wicket had fallen. However, he played a captain’s knock and put. England in a very commanding position. Of course, Indian bowling was found to be wanting. It is good that various sports associations appoint influential persons as their office-bearers. These associations should appoint ministers or other influential persons only till they hold the post. While in the chair, a person actively helps the associations but once he quits or retires, he is simply ineffective. He should gracefully submit his resignation when there is change of guard. This will bring glory to the chair of the association.